Materials flow is dependent on a variety of factors. Construction, cone angles, and stored material type all influence how material moves through storage silos. Mass flow silos do not experience the same potential material flow issues as funnel flow silos. Stored materials move down the silo as a column, with no flow channels, and the first materials in are the first materials out. Mass flow is ideal for materials that are susceptible to segregation based on particle size or density. It is also an ideal flow pattern for coal or other materials that are combustible or perishable. 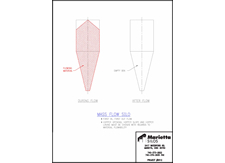 The cone angle used in mass flow silos is between 68-72 degrees, depending on the material being stored and can be lined with a slick material such as stainless steel with a 2B finish. While funnel flow silos are typically more cost effective to construct, costing between 20-30% less than mass flow silos, they are not suitable for all materials. The flow channel drains material in the middle first. As the silo empties, side material flows into the middle channel. Because of this flow pattern, funnel flow silos that are not emptied completely on a regular basis keep stagnant, or dead, material against the silo walls. Not emptying the silo causes material to build up along the silo walls and leads to issues like ratholing or irregular flow. Funnel flow silo angles are between 45-60 degrees. Expanded flow is often used in large diameter silos that do not require long-term storage. They provide many benefits of mass flow silos by reducing the potential for ratholing caused by funnel flow in large storage silos. Just as funnel flow silos must be emptied regularly, expanded flow silos benefit from periodic emptying to prevent a buildup of dead materials. 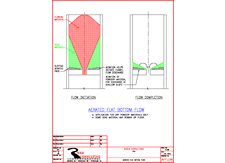 Expanded flow silos feature an interior angle between 45-60 degrees that tapers into a cone angle between 68-72 degrees. Fluidized flow silos are used for fine powders. A large volume of air pumped into the bottom of the silo aerates stored materials to create a flow pattern similar to fluids. Fluidized flow silos are not suitable for coal storage as the introduction of oxygen can lead to spontaneous combustion. Discharge angles for fluidized flow silos are only between 5-10 degrees.